On May 12, 2007, Cassini completed its 31st flyby of Saturn's moon Titan, which the team calls T30. 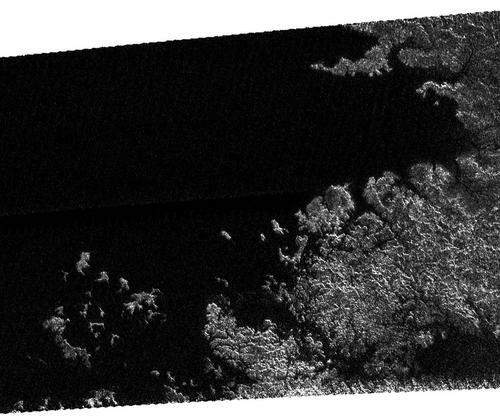 The radar instrument obtained this image showing the coastline and numerous island groups of a portion of a large sea, consistent with the larger sea seen by the Cassini imaging instrument (See Seeing Farther North). The image as shown is about 160 kilometers (100 miles) by 270 kilometers (170 miles) at 300-meter (980-foot) resolution. The image is centered near 70 degrees north latitude and 310 west longitude. The Cassini-Huygens mission is a cooperative project of NASA, the European Space Agency and the Italian Space Agency. The Jet Propulsion Laboratory, a division of the California Institute of Technology in Pasadena, manages the mission for NASA''s Science Mission Directorate, Washington, D.C. The Cassini orbiter was designed, developed and assembled at JPL. The radar instrument was built by JPL and the Italian Space Agency, working with team members from the United States and several European countries.